The Danforth Diamond collection of engagement rings and jewelry is only made using the most eco-friendly selection of HARMONY recycled diamonds. What makes a HARMONY Recycled Diamond different from a traditional diamond? All HARMONY Diamonds come from recycled diamonds. Whether they come from a jeweler, pawn shop or refinery, these HARMONY recycled diamonds have already been introduced to the jewelry chain, causing zero harm to harm to the environment. We proudly recognize the importance of using HARMONY Diamonds and offer all of our eco-friendly jewelry and engagement rings with HARMONY Recycled Diamonds. All HARMONY diamonds are certified by an independent lab for grading and certification. What does that mean? It means while your eco-friendly jewelry or engagement rings may be made from recycled diamonds, they are just as good as newly mined diamonds – better, if you consider they help save the planet. 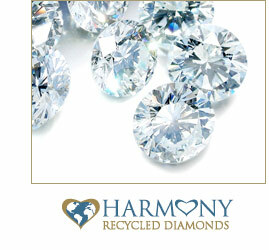 Save money and save the planet by choosing HARMONY recycled diamonds. *Because of the unique nature of HARMONY recycled diamonds, inventory will fluctuate and change daily and the prices cannot be duplicated or used to compare with newly mined diamonds. Ready to do your part to save the planet? Start shopping our Harmony Recycled Diamonds today.